What’s mine is yours, what’s yours is mine. You get married. You move in together. You mix your books on the same shelf, your CDs in the same drawer. Who’s to remember what’s whose anymore? When a marriage ends, the court has to divide property. Wisconsin is a community property state, and community property is too big of a topic for this site, so I’ll sum up. The basic rule is that all property acquired during marriage is to be divided equally, except for that property which is the sole property of one spouse. Community property law, though, is the enemy of sole property. If you “comingle” your property with your spouse’s, it is “transmuted” into community property. So, if you deposit your inheritance into the joint checking account and then combine it with some other money to buy some stocks, you may have just converted your property into community property. It all comes down to whether those funds can be traced back to the sole source. The law, though, tells the judge, if in doubt, split the property between the spouses. So, the more complicated the tracing gets, the more likely you are to see your property split. My Spouse Cheated On Me. Shouldn't He/She Get Less? Are There Any Circumstances Where Unequal Division Is Ordered? I Think My Spouse is Hiding Assets. What Does The Law Say About That? My Spouse Cheated On Me. Shouldn’t He/She Get Less? The law specifically states that property divisions are not to be made based on marital misconduct. It doesn’t matter where he went in the family car, the car is still half his. It doesn’t matter if she was emotionally abusive, she’s still entitled to half of everything. Property division is not a form of judge decreed punishment for bad behavior. Whether one of the parties has substantial sole property. The earning capacity of each party, including educational background, training, employment skills, work experience, length of absence from the job market, custodial responsibilities for children and the time and expense necessary to acquire sufficient education or training to enable the party to become self-supporting at a standard of living reasonably comparable to that enjoyed during the marriage. The desirability of awarding the family home or the right to live in it for a reasonable period to the party having physical placement for the greater period of time. The amount and duration of an order granting maintenance payments to either party, any order for periodic family support payments and whether the property division is instead of such payments. Other economic circumstances of each party, including pension benefits, vested or unvested, and future interests. Any written agreement made by the parties before or during the marriage concerning any arrangement for property distribution; such agreements shall be binding upon the court except that no such agreement shall be binding where the terms of the agreement are inequitable as to either party. The court must start from the assumption that any such agreement to be equitable as to both parties. Any other factor the court may determine to be relevant. 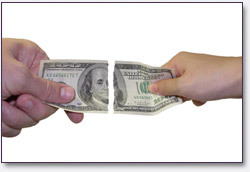 If your spouses, hides, conceals, destroys, ruins, or sells for too little money any asset worth at least $500 within one year before filing for divorce, the law will assume that property is still available for division and the value of the lost asset will go into your spouses share, increasing your overall share of the assets that remain.